More than 32,000 people have submitted comments opposing a military takeover of most of Nevada’s Desert National Wildlife Refuge ahead of a deadline today. The refuge was created more than 80 years ago to protect the largest herd of desert bighorn sheep in the United States. The Air Force wants to assume control of nearly 70 percent of the 1.6 million acre refuge to expand the vast Nevada Test and Training Range. Handing more than two-thirds of the refuge over to the military would strip protections for wildlife and wildlands and cut off public access. 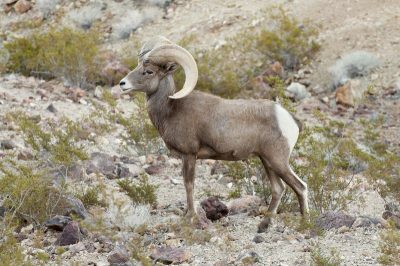 Desert National Wildlife Refuge, the largest national wildlife refuge in the lower 48 states, was designated by President Franklin D. Roosevelt in 1936 to protect the desert bighorn sheep, Nevada’s state mammal. It also provides vital habitat for a variety of vulnerable species, including the imperiled Mojave desert tortoise. The Air Force’s proposal would harm bighorn and other wildlife by expanding military combat operations on the refuge. Plans call for industrializing the largely untouched wildlands with dozens of miles of new roads, constructing more than 100 miles of fencing, bulldozing two air strips and building radio signal emitters. Map of NTTR and Desert NWR prepared by Friends of Nevada Wilderness. The proposed military takeover areas are shaded black. The Air Force is required to respond to the public comments in a final environmental impact statement, expected next autumn. Congress will ultimately decide the fate of Desert National Wildlife Refuge when it takes action on the Air Force’s final recommendation. All images in this article are from Center for Biological Diversity.